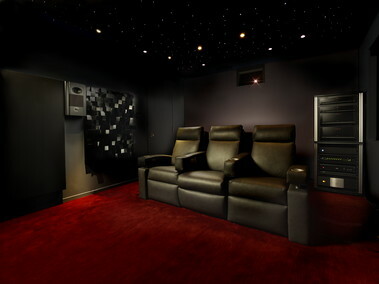 Acoustic Frontiers creates home theaters that match or transcend the quality of commercial cinemas. 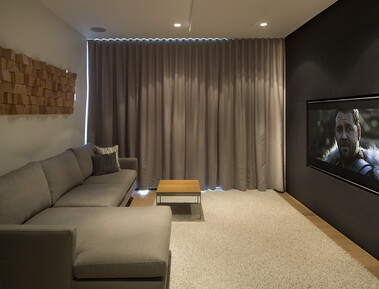 We provide turnkey home theaters, as well as consulting services to audio/video enthusiasts and custom installers. Determining the speakers, amplifiers, and subwoofers to enable the theater to perform at cinema sound pressure levels (SPLs). Selecting the projector and screen to provide appropriate image brightness and contrast for varying theater usages. Specifying the number, type, and location of acoustic treatments to meet targets for sound decay and frequency response. Minimizing seat-to-seat variance in low bass SPL by optimizing seat and subwoofer placement. Placing audio and video components within the room and determining seating placement. Providing and installing audio / video equipment and acoustic treatment, performing construction such as baffle walls, programming control systems. Fine-tuning the audio system to meet industry standards (HAA) for sound quality, sound decay, and frequency response. Adjusting the video system to meet industry standards (ISF, SMPTE) for picture quality, grayscale, and color. Mr. Hart, Carmel Highlands, CA. Design, rather than equipment, separates average from amazing in home theaters. Our home cinemas outperform those from enthusiasts and other installers because of our expertise in room layout, our low frequency optimization service, and our experience in audio, acoustic, and video design. Every room has natural resonant frequencies causing peaks and dips in the frequency response. Most hobbyists lay out seats without considering these room modes, adding subwoofers where they fit, plus a few bass traps. This virtually guarantees bass issues—some seats have suckouts whilst others suffer from boomy, one-note bass. At the seating position, 85% of what you hear is reflected sound, created by off-axis radiation from the speaker bouncing off one or more surfaces in the room. Simple rules, such as placing absorbers at all reflection points, are not true high performance solutions, and typically result in an overly dead, rolled- off sound lacking immersiveness. Most DIYers lay out screen, seats, and speakers by following rough guidelines, putting things where they can, and adding a subwoofer or two at the front of the room. Subsequent home theater problems range from heads in the way of the screen to high frequencies fading across the width of the room to severe seat-to-seat bass variations. Many users choose speakers based on reviews or looks. To match the experience of commercial cinemas, speakers need to reproduce THX specification sound pressure levels. Few driver technologies, particularly speakers using soft dome tweeters, have the power handling for this. The consequences for your home theater include poor dynamics and drive unit failure. Users often pick screens and projectors without considering the different ways in which their home theater will be used. They neglect to calculate how much brightness is needed to illuminate the screen adequately under varying ambient lighting conditions. The consequences of this approach are dim, washed-out images lacking in punch and vibrancy. Acoustic Frontiers creates smooth, tight bass in your home theater using our Low Frequency Optimization service. We determine the frequency, severity, and spatial distribution of room modes through high-resolution acoustic measurements and modeling. Then we solve the problems with custom designed bass traps, multi-sub arrays, signal processing, and optimization of seat/subwoofer placement. Acoustic Frontiers’ approach to Acoustic Design explicitly considers the psychoacoustic effect of reflections. We use ray tracing and speaker off-axis measurements to compare the amplitude and spectral relationship of direct and reflected sounds. 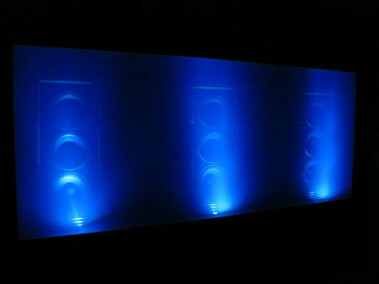 The result is an uncolored, spacious sound that stretches beyond the walls of your home theater. Acoustic Frontiers’ Home Theater Layout service ensures that prime seats have immersive viewing angles replicating commercial cinemas. With 3D CAD layout, all seats have a clear view of the screen, while speaker coverage analysis ensures consistent high frequency dispersion across the audience. Our separate Low Frequency Optimization service takes care of seat-to-seat bass response. 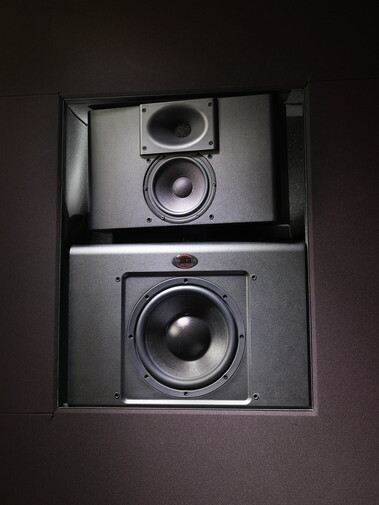 At Acoustic Frontiers, we understand the need for cinema quality sound. When we consider speakers in our Audio Design process, we take into account seating distances and audience coverage, and choose speakers that reproduce THX specification peaks of 105dB with audiophile sound quality. We only select speakers that can provide an impactful and enveloping home cinema sonic experience. Acoustic Frontiers’ Video Design process focuses on the ambient light levels associated with the various ways in which the room will be used. We design projection systems that meet or exceed SMPTE, ISF, and CEDIA industry standards for brightness, color and contrast. Acoustic Frontiers employs CEDIA-certified installers to pull, terminate, and test the wiring for your home theater. We provide wiring schematics and label wires for easy servicing and upgrades. We install equipment, hang acoustic treatment, and build structural elements such as risers and baffle walls. We’ve carefully chosen our manufacturer partners because they provide the performance and function needed for high-performance home theater. Many of our manufacturers are rather specialized; discerning enthusiasts will likely agree that the companies we’ve selected make the best products available for bringing the Hollywood experience home. Reference class Blu-ray and streaming media players. Powerhouse AVRs and Pre-Pros with flexible room correction capabilities. High current amplifiers from the legendary John Curl. Home theater speakers expressly designed to reproduce the dynamic range of movie soundtracks at cinematic SPLs. HD and 4K front projectors with superb color and best in class brightness. Custom made high performance acoustically transparent front projection screens for every situation. Calibration is the process of tuning the home theater’s audio and video system so that it meets quantifiable targets. It is the last 10% that makes a 100% difference. Acoustic Frontiers holds the industry’s top calibration certifications and uses state-of-the-art equipment and rigorous processes to ensure that your home theater performs to its potential. For many enthusiasts and “professional” installers, audio setup consists of running the automated set-up and room correction routine on the receiver. These routines frequently make mistakes, such as incorrectly setting up bass management and poorly integrating subwoofers. The result is a surround sound system that never performs to its potential. For most hobbyists, video setup means switching the display mode to a ‘Cinema’ or ‘THX’ preset. The problem is that variance in display manufacturing tolerances, projection screen materials, and ambient light conditions create an uncalibrated picture, even if the preset was good to begin with. All displays should be calibrated once installed and burned in. Acoustic Frontiers’ Audio Calibration process is based on the industry’s top certification—HAA’s Level II. We use professional grade microphones and thousands of dollars worth of measurement equipment, calibrating to our acoustic measurement targets in order to integrate subwoofers, set equalization and optimize level, distance and crossover settings in your pre-pro. Acoustic Frontiers’ Video Calibration service uses professional grade display software and measurement equipment, working to Imaging Sciences Foundation standards. We calibrate your home theater to quantifiable measurement targets for image brightness, greyscale, color temperature, color points and gamma using display controls as well as state-of-the-art outboard video processors.